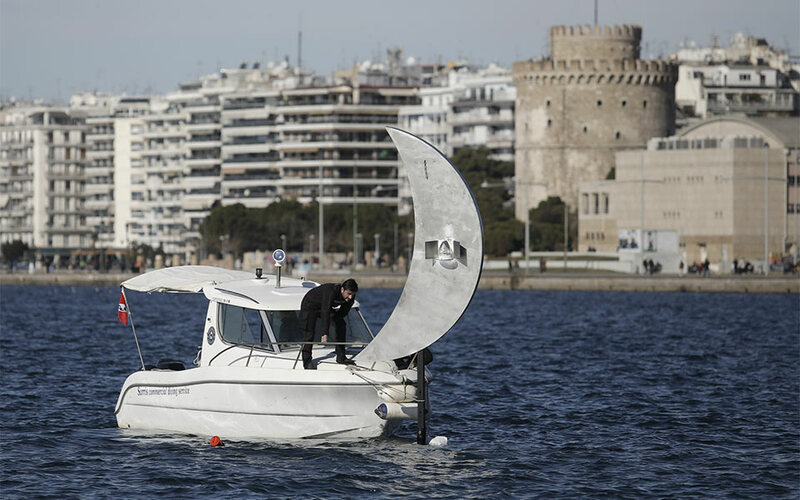 Thessaloniki's moon sculpture before it was vandalized. 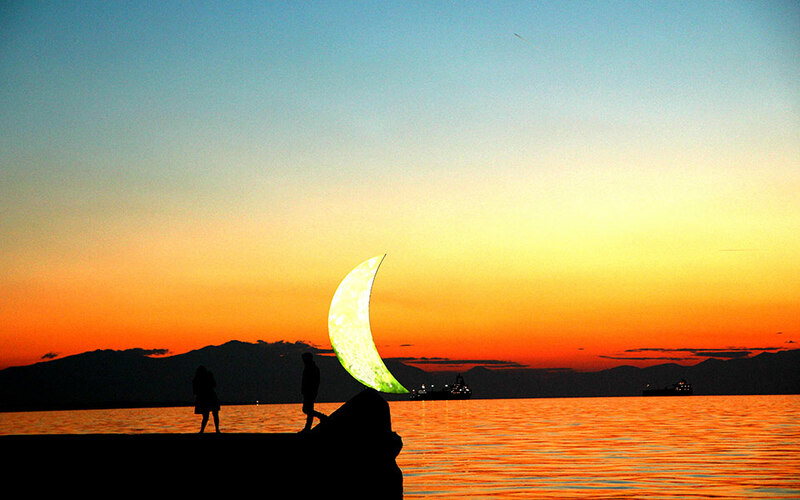 The sculpture of a crescent moon was a feature of the Thessaloniki waterfront until it was vandalized several years ago. Now its back. It first rose over the waters of the Thermaic Gulf in 1995 during Thessaloniki’s Dimitria cultural festival, at the location now occupied by George Zongolopoulos’ iconic Umbrellas sculpture. It then traveled to Sani in Halkidiki in 1998, where it illuminated a rock on the shore for two years. It returned to the waters of Thessaloniki in front of Aristotelous Square in 2000. It then visited Saint Tropez where it stayed for a year. It returned in 2010 to the New Waterfront, where it glowed opposite the hotel Makedonia Palace. Three years ago it was damaged when unknown vandals ripped it from its base and threw it in the sea. Divers were able to salvage it, but the process of re-erecting it became snarled in red tape. All in all, 40 approvals were required from ministries and various departments in the municipality’s quest to reinstall it. This small odyssey has now reached a happy conclusion, and today the Feggaraki stin Akti (“Moon on the Shore”) sculpture by Pavlos Vasiliadis has been installed in its final home in the sea, according to the original design drawn up 23 years ago. The installation of the sculpture was taken on by the entrepreneur Stavros Andreiadis who has also “adopted” two parks along the New Waterfront, the Garden of Sculptures and the Mediterranean Garden, funding their upkeep. The crescent moon-shaped, corrosion-resistant metal sculpture that rises about 4 meters above the waves was manoeuvred into place with a special float, and anchored to the sea bed by divers about 40 meters offshore in between its old position and Zongolopoulos’ Umbrellas. “Having it rise over the water is more impressive than its position on the land. It will reflect better and the light that will form a path to the moon will be an impressive sight,” the artist Pavlos Vasiliadis tells us.